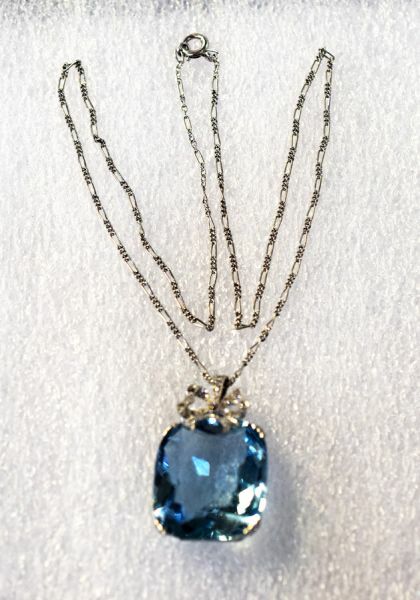 A beautiful Edwardian platinum mill grain bow topped pendant featuring 1 cushion mixed cut medium light blue aquamarine, est. 39.80ct and 16 round single cut diamonds, est. 0.19ct (VS1-I1 clarity & G-H colour). It is accompanied with an 18kt fine white gold figaro link chain that is approx 17 inches (43.18cm) in length. 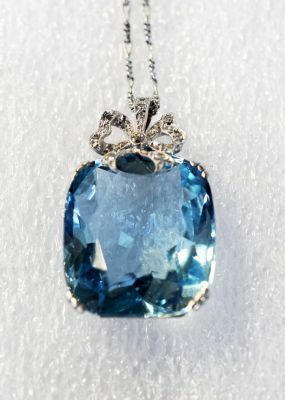 Please make an appointment to see this beautiful pendant.